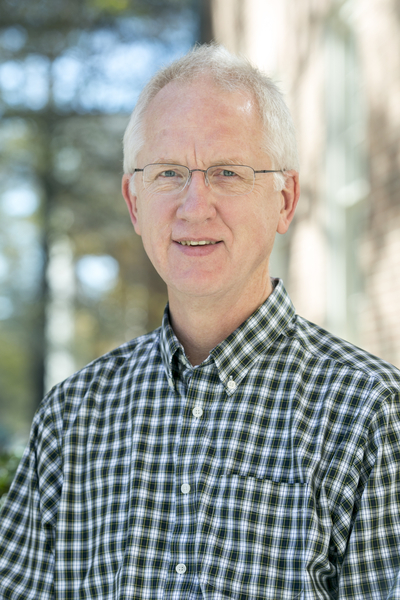 Dr. Ponder joined the faculty at Samford in 1989. Prior to coming to Samford, he worked for six years at Southern Research Institute in Birmingham, where he conducted research on defensive measures against chemical-warfare agents. He has served as department chair since 1997. In his research, Dr. Ponder uses computational methods to provide information about the structure of potential drug molecules and their interactions with biological receptors. For a number of years, Dr. Ponder has worked with Dr. Andy Lampkins, a former colleague now at the University of Evansville, to develop compounds that will inhibit the progression of Alzheimer's disease. Dr. Ponder uses computational methods to elucidate the mechanism of key steps in the synthesis of these compounds and to study the interactions of these compounds with beta-secretase, the enzyme that is targeted by these compounds. When not at Samford, Dr. Ponder enjoys reading, traveling, singing in his church choir, and spending time with his wife, Peggy, and his three grown children. Ponder, M.S. ; Long, J.A. ; Williams, L.M. ; Hamilton, T.P. ; Muccio, D.D. Structural studies on conformationally defined 6–s–trans UAB retinoids. J. Mol. Struct. (THEOCHEM) 2001, 549, 39-45.